Will SpaceX Rockets Launch from a Texas Spaceport? A SpaceX Falcon 9 rocket soars toward space from Cape Canaveral Air Force Station in Florida on March 1, 2013 at 10:10 a.m. EST, carrying a Dragon capsule filled with cargo for the International Space Station. Since the Gemini 4 mission blasted off in June 1965, most of NASA’s orbital flights have been controlled from facilities in Texas. But no payloads have ever successfully rocketed to orbit from that state. About 13 months ago, SpaceX began purchasing property in the area of Boca Chica Beach in Cameron County near Brownsville, Texas. SpaceX now reportedly owns eight parcels, according to the local Valley Morning Star newspaper. Texas state, Cameron County and Brownsville city officials have worked to assemble a package of incentives worth a reported $15 million for development of a local spaceport. The Cameron County Commissioners Court and the Texas General Land Office have cleared the way for intended-purpose land use and safety-related beach closures on launch days. According to Gilberto Salinas, executive vice president of the Brownsville Economic Development Corporation, Boca Chica Beach may be closed to the public up to 12 times per year to provide a safe zone for commercial launches. Ten of those would be designated for liftoffs of the company’s Falcon 9 rocket, while two could be opportunities for the new and bigger Falcon 9 Heavy. The proposed Texas launch site is located within the Lower Rio Grande National Wildlife Refuge, and some local environmentalists have raised concerns about the spaceport’s potential impacts to habitat. Salinas counters that Florida’s Kennedy Space Center is similarly positioned adjacent to the Merritt Island National Wildlife Refuge. He also points out that the required safety margins around rocket have suppressed other industrial or housing development in the KSC area. SpaceX is also gearing up to launch from Vandenberg Air Force Base in California. This site offers access to polar orbits, which many Air Force payloads and environmental monitoring satellites require. A satellite in polar orbit can expose its sensors to changing slices of the Earth rotating beneath it. In this way, the entire globe can be seen in a few days or less. The proposed Boca Chica Beach site would allow for commercial launches to the much sought-after equatorial orbits, where many communications satellites are positioned. SpaceX could safely fly its Falcons through the very sparsely populated corridor between southern Florida and Cuba. Brownsville is the southernmost point in the continental United States. Rockets launched from there would get an inertial boost from Earth’s rotation (such advantages increase as a theoretical launch site approaches the equator, where Earth’s rotational velocity reaches its relative maximum). SpaceX appears to be considering three other coastal locations for the new launch site: Georgia’s Camden County, an unspecified site in Puerto Rico and Florida's Shiloh region (a former orange grove). Each of these three could present a wide range of orbital inclinations ("azimuths", as they are sometimes called), from equatorial to near polar. The Puerto Rico site is closest to the equator, but the difference is not considered significant in the calculus of propellant requirements. The Shiloh, Florida site occupies about 200 acres (81 hectares) located some 20 miles (32 kilometers) north of the NASA pad SpaceX has been using to launch cargo to the International Space Station. The Federal Aviation Agency (FAA) recently requested proposals from environmental consultants to support its study of possible impacts to the Shiloh area from development of a spaceport. The state trade group Space Florida has applied to the FAA for a license to operate commercial-only launch facilities there. All of the launch sites under consideration, including Brownsville, offer an unobstructed expanse of open ocean in the direction of launch. This is primarily intended to provide range safety in case the booster fails early in its flight. But it also raises another intriguing possibility: quick capsule recovery. SpaceX's Dragon capsule, which has successfully completed two of 12 contracted robotic cargo flights to the International Space Station for NASA, currently lands in the water. 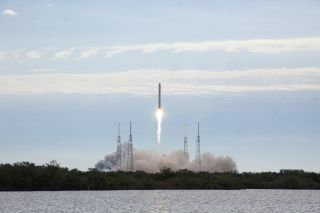 All Dragon missions thus far — including its demonstration flight to the orbiting lab — have launched from Florida and splashed down off North America's West Coast. The Brownsville, Texas site, therefore, offers an enticing combination of deep southern location, launch from the beach, favorable regulatory environment, experienced workforce and ocean-shipping terminal. Clearly, SpaceX is exploring an alluring strategy of creating a sizeable private commercial spaceport there. SpaceX's Falcon 9 booster can lose one of its nine engines and still complete its primary mission. That's precisely what happened on Oct. 7, 2012, during the rocket's first operational resupply flight to the International Space Station. NASA's huge Saturn V rocket, which boosted Apollo and Skylab missions four decades ago, had a similar capability. The Saturn V's second stage — named the "S-II" — clustered five J-2 engines. The unmanned Apollo 6 and the famous "successful failure" Apollo 13 each experienced engine loss during the S-II phase of boost. Both missions successfully made it to low-Earth orbit, though in the case of Apollo 6 the final orbit was a much more eccentric ellipse than the planned one, which was nearly circular. Other than Falcon 9, no rocket in current operation can successfully fly with an engine out. By contrast, all passenger jets can. In fact, they must in order to be rated for commercial operation. As with jet airliners, rocket engines must also have the capability of restarting while in flight if the vehicles they power are to be reusable. In March of this year, SpaceX completed prerequisite trials of its new Merlin 1D engine variant, specifically designed to restart during a mission. "The Merlin 1D successfully performed every test throughout this extremely rigorous qualification program," said Elon Musk, SpaceX CEO and chief designer. Testing of the up-rated variant of the Merlin engine paves the way for a reusable version, designated Falcon 9R. Later this summer, these engines are slated to power the launch, from Vandenberg Air Force Base, of the Canadian Space Agency's CASSIOPE communications and solar weather satellite. SpaceX is likely to try an engine restart on that flight. It will be the first step to learning techniques for returning the booster to the ground under power — eventually, right back to the launch site. SpaceX has not stated whether or not it intends to fly reusable boosters from whatever private launch site it selects, but doing so could significantly lower the firm's operational costs and shorten the time between flights. Better spaceflight economics — especially reduced launch costs — have long been considered essential for robust development of the solar system’s potentially habitable frontiers. Musk has repeatedly and publically stated his desire, and his company’s goal, to explore and settle Mars. In an interview with SPACE.com last November, Musk characterized the colonization of Mars as a partnership between commercial companies and governments. He put a roughly estimated price of $36 billion on the enterprise. A robust commercial spaceport — in Brownsville, Texas or any of the other sites now under consideration — would likely put SpaceX in a much better position to self-fund at least a portion of that goal.